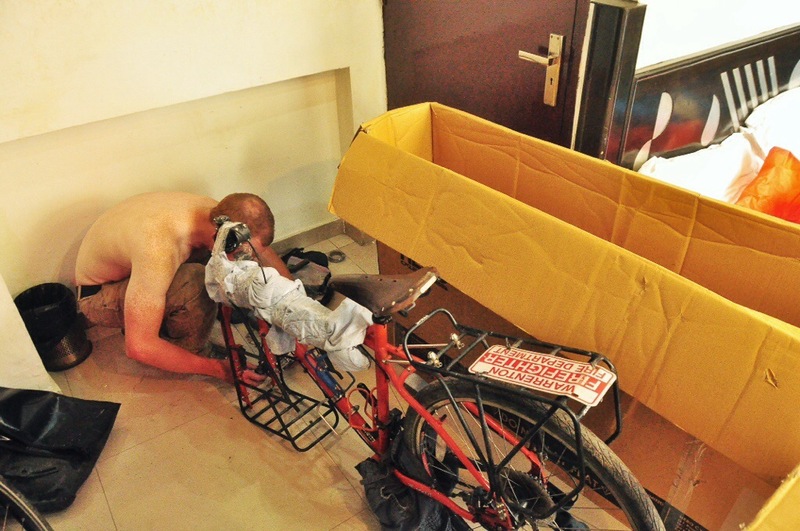 Many people have asked me how I got my bike to Asia (no, I did not cycle across the ocean) so I have decided to dedicate this post to the laborious process of boxing up a bike in order to fly with it. First, you have to find a bike box. In many places it’s possible to get a free one from any bike shop because the box you need is the same box that new bikes come from. Unfortunately here in India that proved to be a bit more difficult. 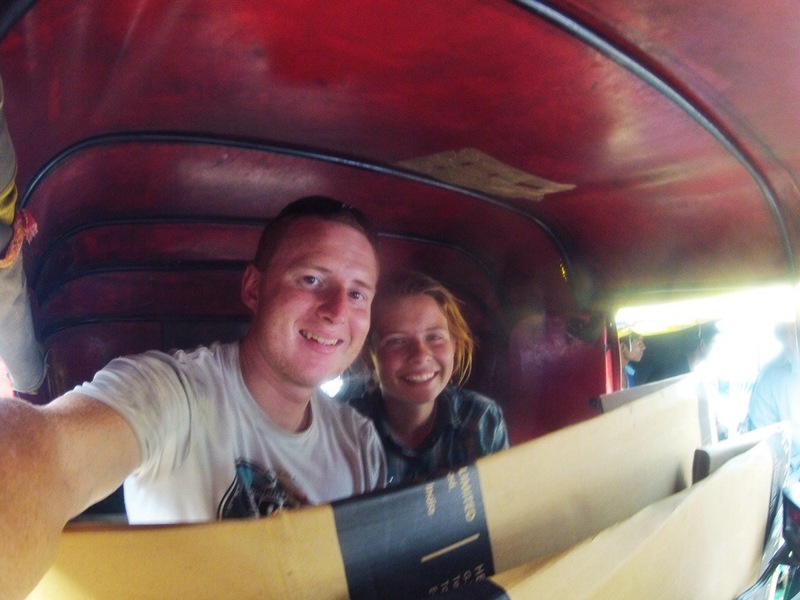 We ended up finding one in a market in Delhi (there is one guy in the bike market who keeps his boxes then sells them for two dollars) which we then squished into a tuktuk with us. Next, find a boy willing to give you a hand (seriously gals, I haven’t yet packed up my own bike since our estrogen seems to attract bike-savvy men from miles away). Just kidding, you probably know by now that I believe us females to be capable of anything, but in this case, Kevin is indeed in charge of both bikes. 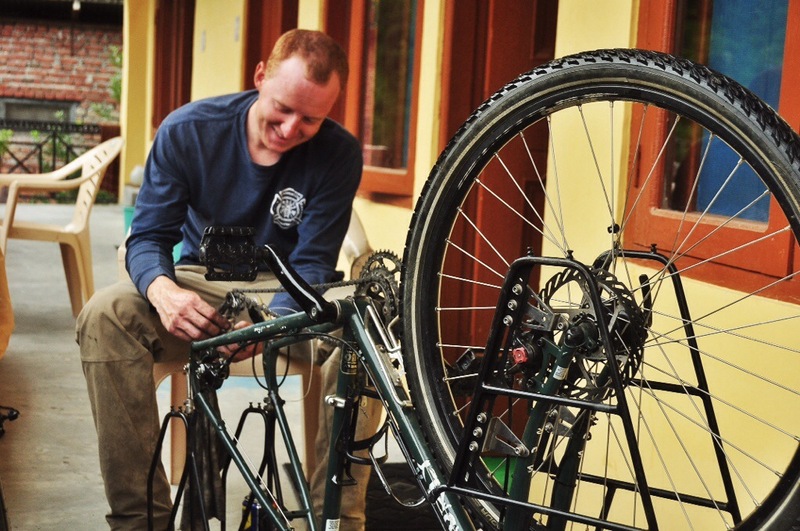 As you begin breaking down your bike it’s a good idea to wash it as you go since it enables you to check for broken parts while giving your bike a well-deserved scrub. It’s important to take off the pedal and tires, and for us our racks. Besides that you can choose how much you want to take off or adjust depending on the size of your box. You should check with your airline beforehand about their oversized luggage policies in order to figure out the maximum weight and dimensions you are allowed. Since our small airline says “call us for information,” we just decided to hope for the best. It ended up being 75$ each, but hey, at least they took them! We had a hard time taking off the pedals and had to get a bit creative with two wretches and the seat post for leverage. Fitting the pieces snugly into a box is a bit like a very frustrating puzzle. This time though our boxes were large enough that I could even leave my bike tire and rack on! 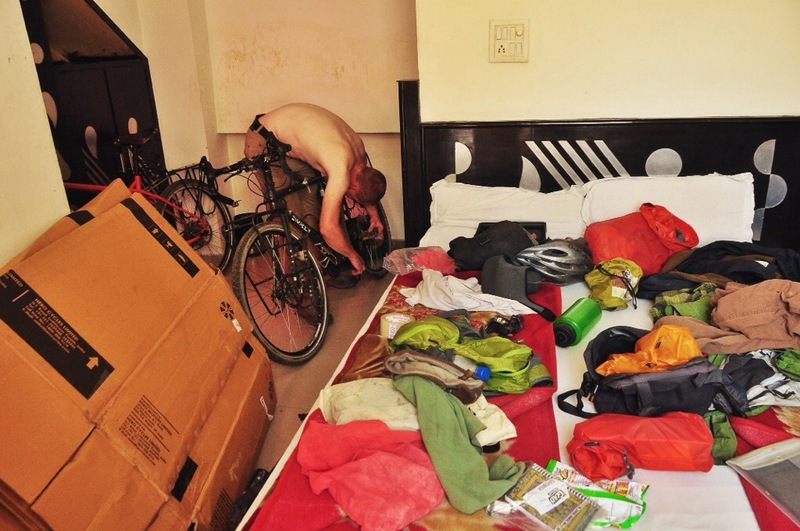 Make sure it is in there securely and then pad it with whatever you can find (clothing is a good option) since your poor bike is going to be in for a rough ride once it leaves your hands at check-in. Time to close it up! Make sure to tape it securely, though often security undoes all of your hard work when they check your luggage. Voila! Your bikes are now ready to fly. Unfortunately some airlines charge extra to fly your bike (I paid 200$ for my last flight, and 75$ for this one, though many Europeans report that they have never had to pay extra for their bikes using European companies), and most have some type of weight and dimension limits so it’s important to check those details beforehand according to your airline. It’s a stressful few days preparing and then flying with your bikes, but it will be well worth it when you ride out of the airport in whatever country awaits you. This entry was posted in Georgia and tagged airplane rules flying bike, bicycle on airplane, cycle on airplane, how to fly with bike, How to pack up bike, touring bike on airplane, travel with bicycle by The Wandering Nomads. Bookmark the permalink. Hi. Thanks for the informative article. I’d like to add my two words here – Shower Curtain! I flew my bike from Egypt to Switzerland last year on EasyJet. It cost about a 60 euros fee however by cycling right up to the airport I saved a lot on expensive transport to the airport (only taxi options). The convenience of being able to cycle right up to the airport, and then at the other end cycle a few km from the airport to pitch a tent for the night, felt very liberating. I had the same issue as you for finding a box in Egypt on the Sinai peninsula – I couldn’t. So here’s a tip for people – many airlines accept bag packaging as well as box. I purchased a plastic shower curtain for about $8 from a local market. Although airlines specify that you need a proper bike bag, as long as it wraps all the way around and the bike is folded according to airline specs, it goes through fine. The huge advantage in a lightweight bag is that you can carry it around on your cycle tour and use it several times before it eventually gets wrecked. And as a bonus, my bike bag / shower curtain doubled as a tarp for sleeping on the ground as I cycled across France the following month. Another cheap option for a bike bag is a trailer tarpaulin from a home and garden shop – you can find one for about $10, and that’s what I’m currently using for bike bag and camping ground sheet / mattress. 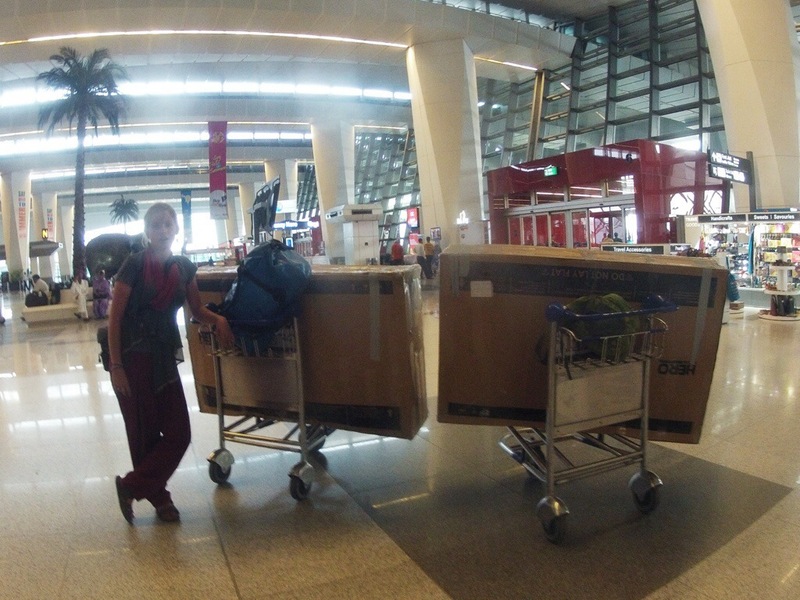 Some people have reported damage to their bikes while using bags on airlines. My bike had no problems, but I did protect the components quite well. I cut the top off a plastic water bottle and put that around the gear system and de-railer, then I wrapped clothes around the more delicate parts of the bike. Some people recommend a transparent bag so that luggage handlers are well aware of the delicacy of the bike components inside. 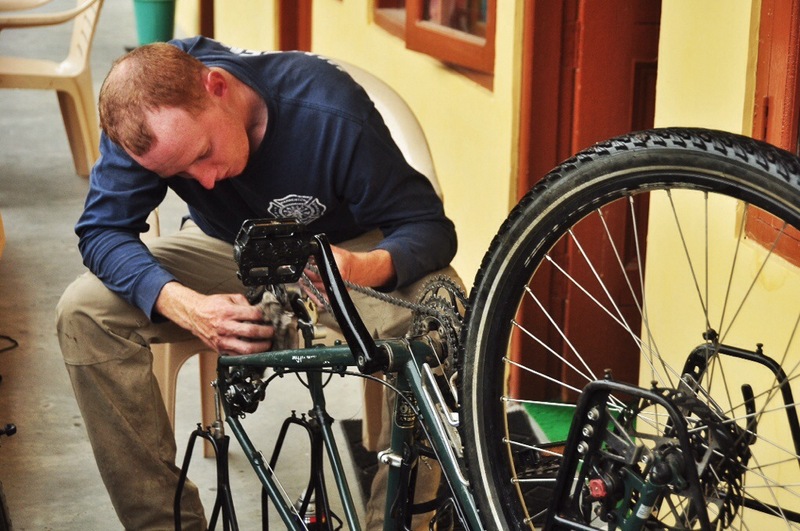 How much do you have to take your bike apart? Well, it depends a lot on the airline’s requirements, and your own preferences. In my case I removed both wheels and tied the pedal to the frame to avoid movement. All-in-all, 30 mins to pack up the bike, and 15 mins to unwrap and clip the wheels back on at the other end. I think you meant to say “take off the wheels” not tires. Unless, of course, that is what you meant to say ;-). Mostly, it’s only necessary to remove the wheels and maybe take a bit of air out of the tires to allow for more room. BTW, I just started reading your blog and love it! Is there any place where you discuss your bike and other equipment? What has worked and what hasn’t, etc.? Us tourist love to hear about the kit! Ha no you are right, that’s me not knowing anything about bikes! No I actually hardly talk about gear (probably cause I know nothing…) but sometime I’m make upa gear post! Thank you for your informative post! I just started following your blog and you have inspired me to plan more touring! Just like Bryan, I was curious about how your bike has been working for you, as I am planning to invest in a tour bike that’s fairly light, and can take me both on paved road, and unpaved road (as you have been doing). I have done a few trips on bikes that were cheap (an old hybrid bike and a low-end mountain bike), but have caused me quite a bit of wrist and lower back pain. I see that you are both riding Surly bikes. How have you liked it so far? Are you experiencing back or wrist pain when you ride for long days? Thanks in advance! I love the surly, and as a long term investment, I would recommend it! I use to get wrist pain, but not since changing my handlebars a bit. I’ll write more , maybe a whole post, so those interested can get an idea about the gear! While I lack Shirine’s international touring experience, I do know quite a bit about touring equipment and bikes in general. I completely agree that Surly makes outstanding bikes. The LHT, or “Long Haul Trucker” is very popular. What I want to emphasize is the importance of ” fit”. Regardless of brand, if you’re not fitted properly you will be uncomfortable. That means the right seat hight, stem length, handlebar angle, etc.. There are other factors. A good bike shop will know how to “fit you” and if they don’t, go elsewhere. If your budget allows, a custom frame is a sweet thing. In any case, stick with steel. It’s your best bet all round. Yes! Fit is for sure the most important. 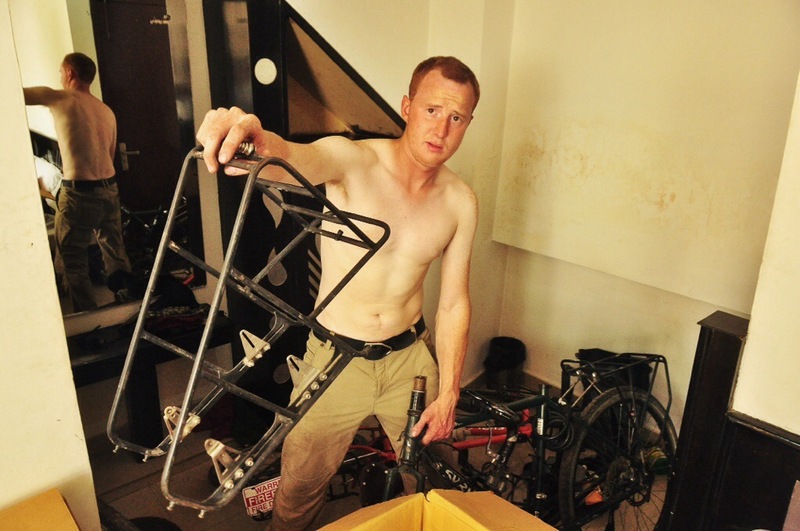 I have seen people cross continents on second hand fifty dollar bikes…just as long as they fit. Oh, and I also wanted to ask you if you had any issues changing your tires to fatter ones for your trip in Asia. Did you have to get a longer axle or fork or did the tires fit just fine? Hey there. I’m going to miss this part of your trek. However, I look forward to your next blog/adventure. Carl is out riding PCH. He flew to Seattle and is now at Sunset Bay State Park south of Coos Bay. That’s greats! Hope he is having fun. Then, I came across this post, and I am happy and scared to say I have no more excuses. Who knows? Could be me next summer! 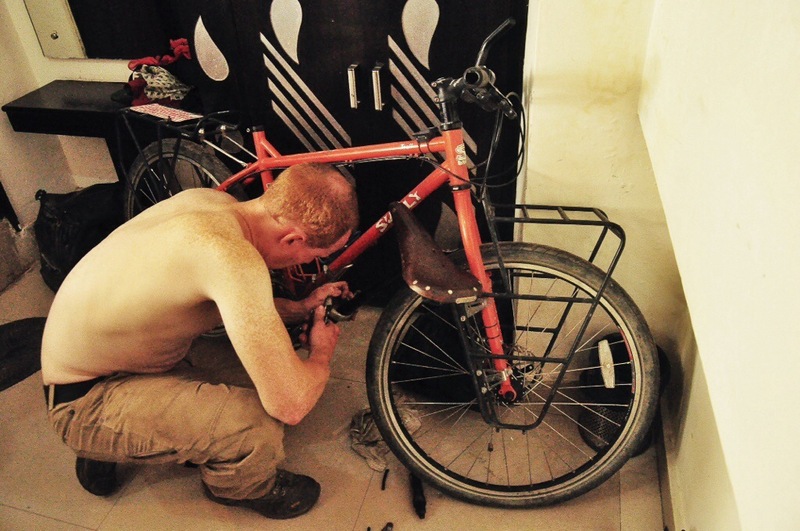 Learning mechanic skills as a cycle tourist is a very handy skill. 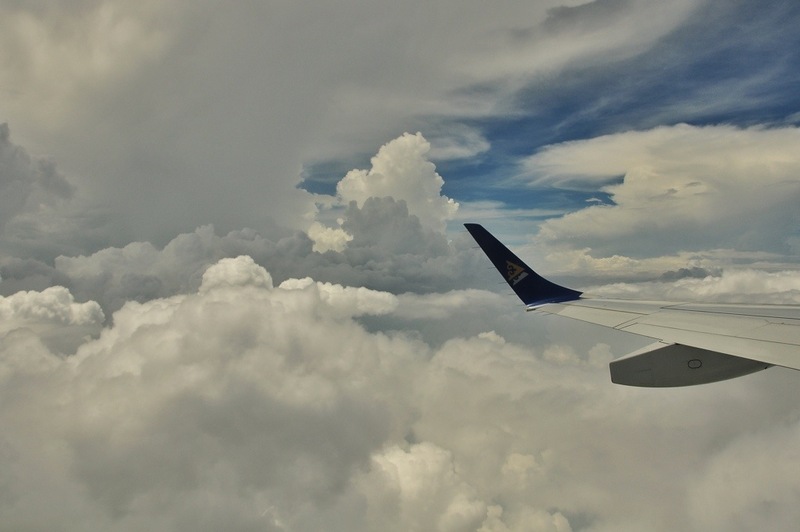 I have yet to pay any extra fees for my bicycle or recumbent while traveling on airplanes. The key is to find out their maximum width, height, length, and weight allowed then custom build a box around just your frame (and yes the threadless headsets can be easy to remove to remove the fork from the frame). Separate box for wheels and other items. Use your panniers as “carry on”. Yes, a little more work but I have saved $1,000’s by packing accordingly. BTW never use the word “bicycle” with the airline folks, instead overage charge!! Always call your luggage your “exercise equipment” when the security people ask…. If your items fit on the regular luggage conveyor belt there should be NO fees for special handling. Happy flying with your stead!!! We’ve been pondering this bike boxing quite a bit as our trip to South America is coming up in a few months. Super helpful post. Thanks lady. Happy travels.